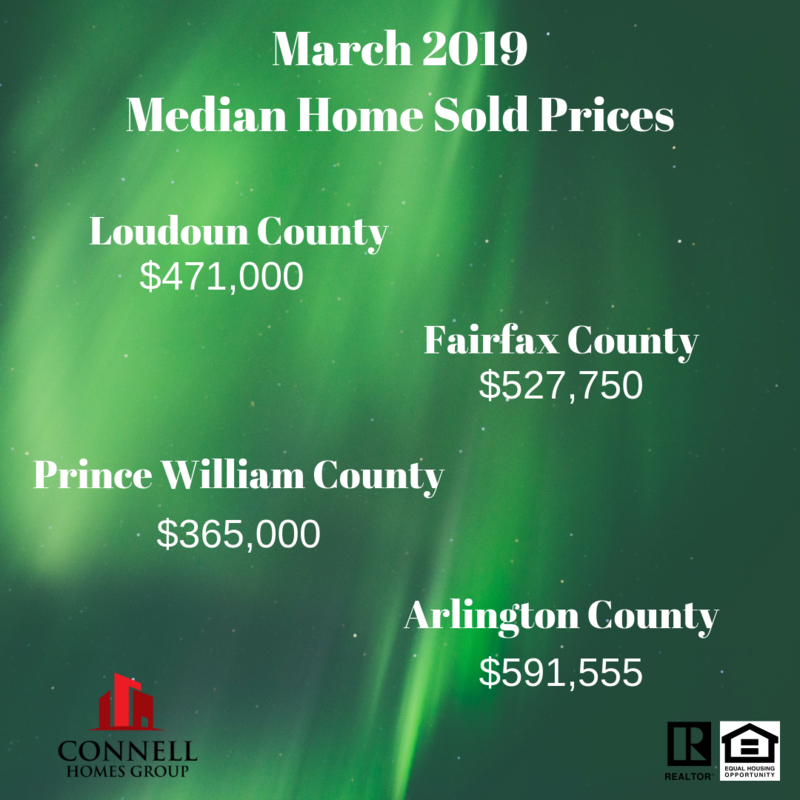 The MEDIAN SOLD PRICE for Loudoun County in March 2019 is $471,000, which is down approximately 1% over March 2018. Year over year, the number of UNITS SOLD was down nearly 7%, while average days on market decreased 28%, from 74 to 53 days. The AVG SALES PRICE TO LIST PRICE remained steady in the upper 98th percentile from March 2018 to March 2019. The MEDIAN SOLD PRICE for Fairfax County in March 2019 is $527,750, which is up 4% over March 2018. Year over year, the number of UNITS SOLD was down 6.5%, while average days on market decreased nearly 28%, from 54 to 39 days. The AVG SALES PRICE TO LIST PRICE increased from March 2018 to March 2019, rising into the 99th percentile. The MEDIAN SOLD PRICE for Prince William County in March 2019 is $365,000, which is up 1% compared to March 2018. 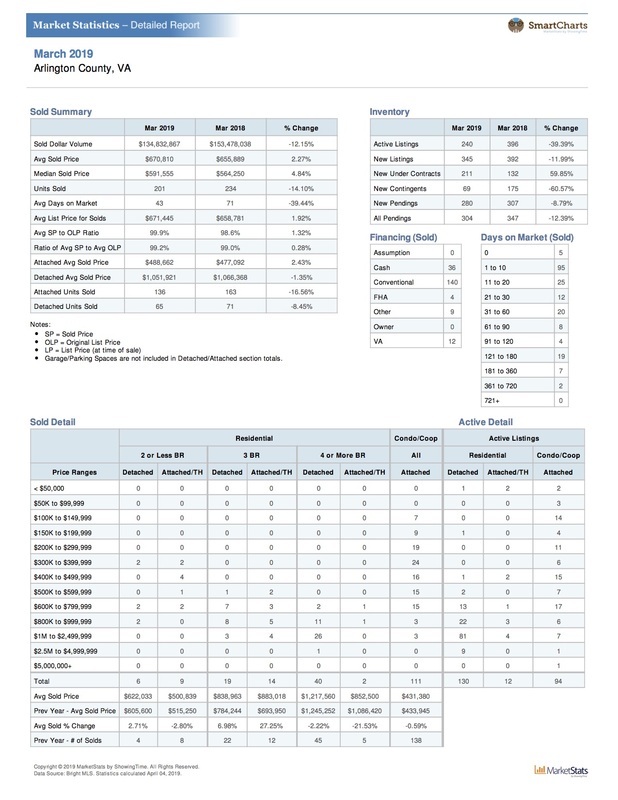 Year over year, the number of UNITS SOLD is up slightly, while average days on market dropped over 7%, from 56 to 52 days. The AVG SALES PRICE TO LIST PRICE remained steady from March 2018 to March 2019, in the 98th percentile. The MEDIAN SOLD PRICE for Arlington County in March 2019 is $591,555, which is up nearly 5% compared to March 2018. Year over year, the number of UNITS SOLD was down 14%, while average days on market decreased almost 39%, from 71 to 43 days. The AVG SALES PRICE TO LIST PRICE increased from March 2018 to March 2019, hitting 99.9%!